What's it about? Simba the lion cub flees into the wilderness after a terrible accident. Will he face up to his responsibilities and return to take his rightful place as the Lion King? Is it any good? Very enjoyable stuff from Disney. Great visuals, some tremendously exciting action (especially the marvellous stampede sequence) and some hummable songs (Hakuna Matata, Can't Wait to be King, Can you Feel the Love Tonight?) by Elton John and Tim Rice, even if they don't exactly drive the story along. Best of all, we get one of Disney's most memorable villains in Simba's evil uncle Scar, magnificently vocalised by the sneering, mavelolent tones of Jeremy Irons. 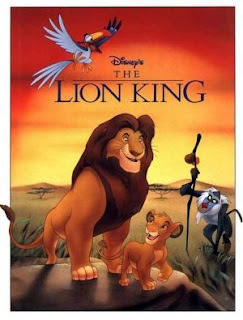 Also, if you ever wanted to see a blatant example of come-to-bed eyes on a cartoon lioness, this is the film for you. Worth noting that it might be a bit too intense for younger children, though, as it doesn't really deliver enough comic moments to offset the scarier ones. There were plenty of tots whimpering and looking through their fingers at the screening I attended, but very few of them were laughing, even when the warthog farted. Still, it's character building for the little cherubs. (Watching The Lion King, that is, not farting. Although that's good too). Anything else I should know? Apparently inspired by the plot of Hamlet, but if this were an exam, it would be hauled up in front of the disciplinary committee for plagiarising Bambi almost in its entirety. Lovable baby creature? Check. Funny friends? Check. Childhood sweetheart? Check. Death of a parent? Check. Fiery climax? Check. Life lessons? Check. Circle of Life? Check. Obviously, the only way to sort out the true winner is in a film of Bambi Vs Simba : Fight to the Death ! With a few songs thrown in, naturally. Come on Disney, give us the film we all want to see! What does the Fonz think? Falls just short of top-tier Disney, but very good, nonetheless. Hakuna Matata!